Thrilling Game of Throw and Catch in Summer! These awesome frisbee rings will travel far. It is easy to throw and made of lightweight durable plastic. The lightweight plastic construction and smooth edges make it easy to throw and catch for children of all ages: 3-12 years old and fun for adults too.. The frisbees measure 10.8" in diameter. Throwing and catching will bring your kids tons of fun! It's perfect for backyards, parks, pool and beach. AERODYNAMIC DESIGN--- Our unique design flies straight and can be caught in the smallest of hands, on your wrist or even your foot! Perfect for young children! LONGER FLY--Perfect to fly over distances of 15-30 feet and can soar up to 80 feet on calm days and indoors! 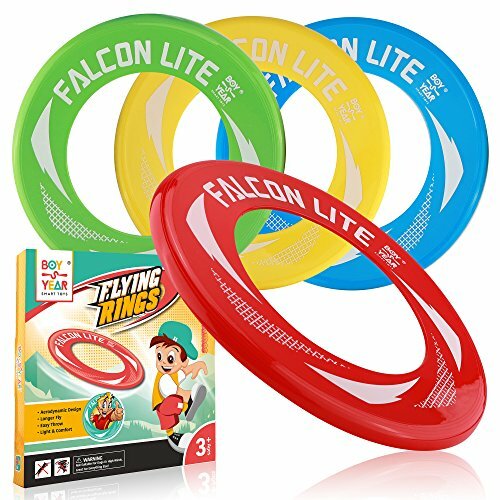 LIGHT & COMFORT--At just 33g, these best-selling flying toys are 80% lighter than standard frisbees, which means safe, comfortable catches. Kids Love flying rings and so will you! This four pack comes with one red, one blue,one green and one yellow! 100% MONEY BACK GUARANTEE-- If you aren't satisfied with your purchase, simply return the Frisbee rings for a FULL REFUND with no questions asked. If you have any questions about this product by Boy-S-Year, contact us by completing and submitting the form below. If you are looking for a specif part number, please include it with your message.